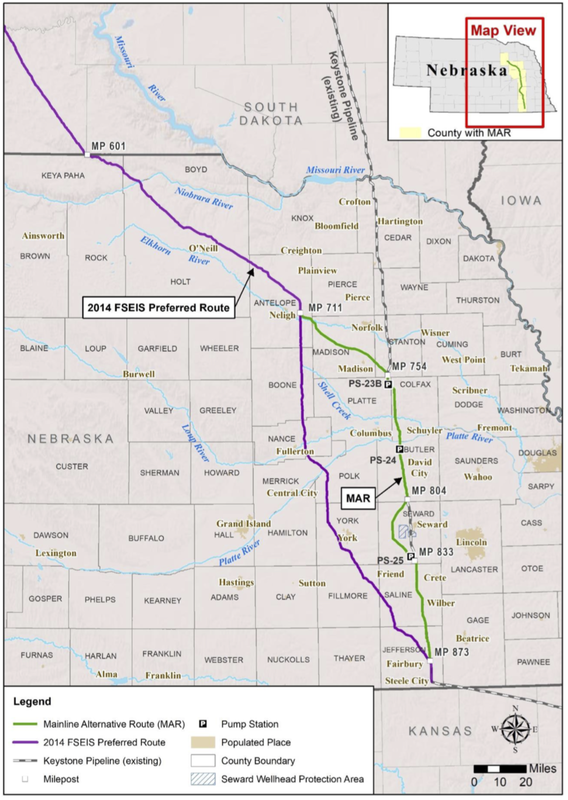 The US State Department released its Draft Environmental Assessment (EA) of TransCanada's Keystone XL pipeline this week, this time reflecting the Mainline Alternative Route (MAR), as recently approved by Nebraska's Public Service Commission (PSC). The MAR differs slightly from TransCanada's Preferred Route, requiring one extra pump station and 8 additional kilometers of pipe. The approved route also runs along Keystone's existing right-of-way for about 145 kms, as preferred by the state of Nebraska. Keystone XL is the fourth phase of TransCanada's Keystone network. The original 590,000 bbl/day Keystone pipeline runs 4,300 km from Hardisty, Alberta, routed east to Manitoba, then south to the US Midwest and Gulf Coast. In contrast, Keystone XL runs 1,900 km to Nebraska, connecting to lucrative markets in the US Gulf Coast (USGC). Canada currently exports about 4.2 million bbl/day of crude to the US, mostly in the form of heavy diluted bitumen from the oil sands. About two-thirds of that crude is destined for the Midwest via Enbridge's Mainline network. Refineries in the Midwest are nearing their maximum capacity for heavy crude, leaving Alberta desperate to find another buyer. In contrast, the USGC has a refining capacity of almost 10 million bbl/day, more than double the Midwest region. Its highly complex refineries also make it the world's largest market for heavy sour crude. In its ruling, the State Department acknowledges that heavy oil imports from Mexico and Venezuela into the USGC are in major decline, leaving the region scrambling to find an alternate supply of heavy oil. Although Canadian exports to the USGC have been rising in recent years, the area is grossly underserved by pipelines from Canada, making it reliant on more expensive crude-by-rail. Keystone XL is designed to transport 830,000 bbl/day of crude out of Alberta and North Dakota. About 12% of the line's capacity (100,000 bbl/day) is reserved for light Bakken crude from North Dakota. TransCanada has confirmed 555,000 bbl/day of firm shipping commitments to the Gulf Coast and 155,000 bbl/day to the Cushing storage hub. As in previous environmental assessments, the State Department concludes the pipeline would have little impact on land use, water bodies, air quality and wildlife. Since the federal EA now aligns with state approvals, the project now has all permits in place to begin construction in each of the states. The Draft EA is open to comments from the general public for the next 30 days. The company has yet to announce a positive final investment decision on Keystone XL. During its second quarter earnings release this week, TransCanada says it expects the pipeline to be fully subscribed and hopes to start construction early next year. Pending the outcome of three legal challenges in Montana and Nebraska, the company plans to announce a positive final investment decision by year-end or early 2019. If all goes according to plan, Keystone XL is expected to come into service in 2021.